Peterson directed one of Pixar’s BEST films with ‘Up‘. 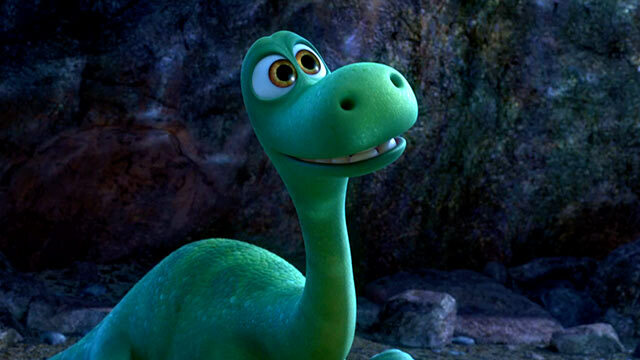 Peterson wrote and was directing ‘The Good Dinosaur‘ for a good while with an impressive voice cast that included John Lithgow, Neil Patrick Harris, Bill Hader, and Judy Greer. However, as time went on, Peterson and the execs at Pixar didn’t agree on certain story plots and Peterson found it difficult to finish the final act of the movie. Not only that, during this time, Pixar laid off several dozen employees. 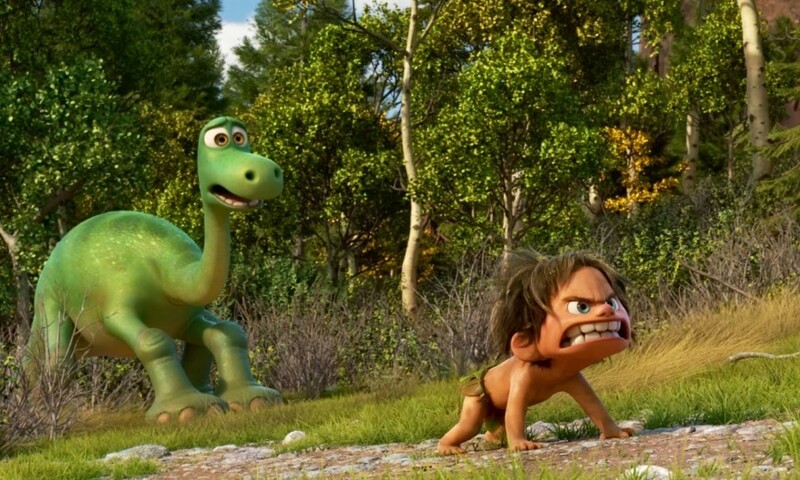 It wasn’t the happiest of times at Pixar for sure, which is why ‘The Good Dinosaur‘ was delayed a year or two until now with almost a completely new story and voice cast. Usually with these sorts of troubles at a studio and during production of a film, the movie itself doesn’t exactly live up to be good, but Pixar being Pixar, that isn’t the case with ‘The Good Dinosaur‘, which lucky for us. 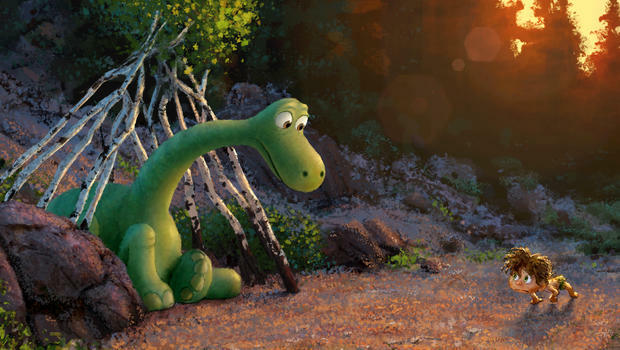 ‘The Good Dinosaur‘ is actually quite good, but wouldn’t be considered the best Pixar has put out. Not even in the top five, which is due to a loose narrative and rushed ending. That all being said, this is by far the BEST looking Pixar movie to date. All of the photo-realistic backgrounds are stunning. It’s as if they used real life locations and just added the CG animated characters to it. It’s very beautiful to look at from start to finish. ‘The Good Dinosaur‘ takes place in an alternate universe where that big asteroid didn’t destroy the dinosaurs all those millions of years ago, but instead, just flew on right by Earth, missing it completely. Cut to a few million years later and the dinosaurs talk and live in farm like houses and grow crops, such as the case with the Apatosaurus family. 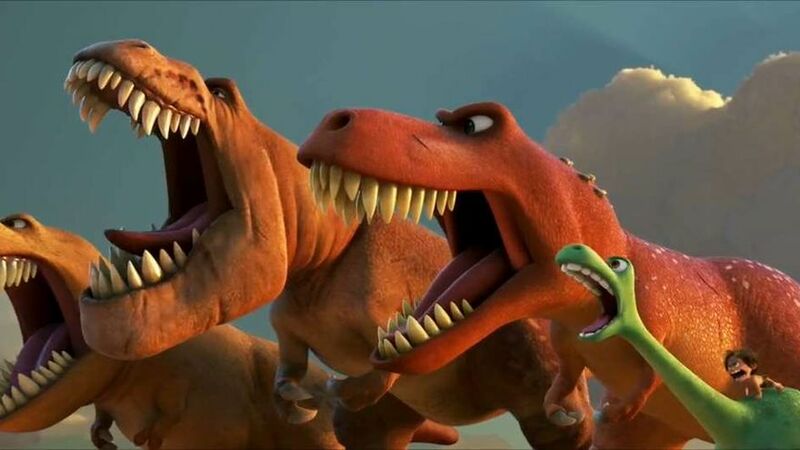 The father and mother (Jeffrey Wright and Frances McDormand) have three little dinosaurs to begin the movie with a tiny dinosaur named Arlo the youngest and weakest. After some time spent on the family farm, Arlo is separated during a weather event from his family and home and swept down river, far from his home. He befriends a little “critter”, who is actually small human child that resembles Mowgli from ‘The Jungle Book‘. The two have an adventure and meet some crazy and at sometimes, some scary creatures on their way back to find Arlo’s home. There are a ton of similarities here to ‘The Lion King‘, ‘The Jungle Book‘, and even an fun and unexpected drug sequence, similar to ‘Dumbo‘ here, but nothing really stands out on its own. Arlo’s character is that he is scared of almost anything and everything, and must face his fears to see the beauty and confidence in himself and the world. It gets a little tiresome and old throughout the film, but it still has some excellent moments and a decent pay off, although it would have been nice to see a more fitting ending here. Anna Paquin (‘True Blood‘) and Sam Elliot (‘The Big Lebowski‘) turn in some voices, as well as the hilarious Steve Zahn, which should please audiences. The director who came in to finish ‘The Good Dinosaur‘ was Peter Sohn who has been a long time animator on a variety of Pixar films, with this being his first feature film to direct. He did a great job here visually speaking and look forward to his next endeavor, because the guy has some serious talent. ‘The Good Dinosaur‘ is a solid entry in to the Pixar archive of movies, but won’t be remembered in the likes of ‘Up‘, ‘Wall-E‘, or ‘Inside Out‘. Still though…. This entry was posted on Tuesday, November 24th, 2015 at 5:51 pm	and is filed under Film, News. You can follow any responses to this entry through the RSS 2.0 feed. You can skip to the end and leave a response. Pinging is currently not allowed. « Tom Cruise is Circling ‘The Mummy’ From Universal!!! Just like old times. (Lara laughs) I think that's the first time you've actually smiled because of me. I started thinking. I was tired of doing things somebody else's way, and it was always going be somebody else's way. So, you abandon you're men and betray your country? Leaving my men and my country, that didn't actually hurt as much as I thought. But leaving you did. You're a hard act to follow, Croft. You know why you and I get along so well? [Laughs harder] We are nothing alike. I don't think we're alike, but I do think we're a pair. Opposite sides of the same coin.